18 Uniquely designed Handcrafted wooden garden and pond bridges to choose from, or we can custom build any kind of bridge you would like. We are the original designers and builders of the garden bridges pictured. All of our bridges are made of western red cedar which is naturally insect and decay resistant. 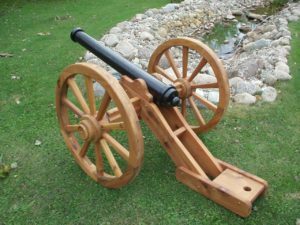 Wooden Cannon. 6ft long by 4ft wide. $995. All wooden garden bridges can be made to any length or width you would like. The Bridges come with pictured instruction, and all pieces are marked for very easy assembly. The WC-52 Bridge took 2 people 4 hours to assemble. We accept Visa, MasterCard, or a Check. 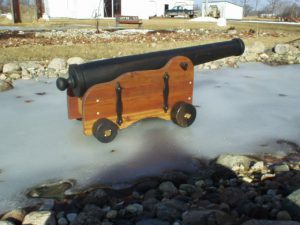 Ship’s Cannon. 16ft long by 4ft wide. $449. We have Garden Bridges and Gazebos throughout the U.S.A. and Canada, and 3 in Hawaii. All of our handcrafted garden bridges have center frame work in between the beams, for a stronger and sturdier bridge, the frame work also makes the deck boards twice as strong. Our uniquely designed wooden pond and garden bridges come from 35 years in the building trades, so you can be assured to have a very well constructed garden bridge. Handcrafted wooden garden and pond bridges, designed and built by the Cedar Bridge Shop with 30 years of experience, so you will be assured of getting a top quality wooden bridge that will last for decades. Our wooden bridges are made of western red cedar, red wood, or treated pine. We have built wooden garden bridges 4-52 feet long, custom built wooden pedestrian bridges to your specifications. Our landscape wooden bridges are the strongest bridges you will find, with one piece beam construction, center frame work and larger beams and rails. We have 24 different designs of elegant wooden garden and pond bridges to choose from. We also provide landscape garden bridge plans, repair bridges and designer wooden bridges. 1- Asian style bridge 5 x 40 ft. at the Pittsburgh Botanic Garden in Pa.
1- 33ft. bridge at Fontenelle Hills in Omaha, Ne. 1- 5×30 ft.SJ style bridge in Rocky Hill, CT.
and about 400 others across the U.S.A. Custom built wooden bridges for the garden, trail, hiking path, or a golf course. All of our bridges are built to last with very day use and high traffic. The size of the beams on our bridges are much stronger and heavier then our competitors. As you can tell by the pictures of all the garden bridges, we take pride in our workmanship. 11154 Co. Rd. 71 N.E.